Tinnitus is an extremely common problem affecting millions of people worldwide. 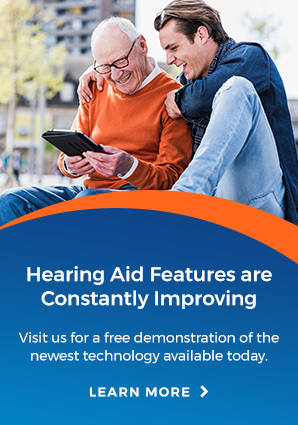 You're not alone, and there are options available for assessment, treatment and management with Arnold Hearing Centres in Guelph, Simcoe, Mount Forest and Kitchener-Waterloo. Tinnitus is a medical condition that causes someone to perceive or “hear” sounds that are not actually present in the environment surrounding them. It is a “phantom” perception that is generated somewhere along the auditory pathway. Many people experience tinnitus as a ringing in their head or ears, however, it can take on a variety of other sounds including buzzing, humming, crickets etc. Tinnitus is the perception of sound in one or both ears, or in the head, when no external sound is present. The exact cause or causes of tinnitus are not known, although there are several things that can trigger or worsen tinnitus. While there is currently no cure for tinnitus, there are treatment strategies available to help people successfully manage their tinnitus. The first step is to come in for a Tinnitus Assessment at which time our Audiologist will go over the treatment strategies with you. How does the personalized Tinnitus program work? Sound Options Tinnitus Treatment: Specialized software used to develop a customized sound therapy that is embedded into music and minimizes brain changes causing your tinnitus. This way, we can reduce your tinnitus more effectively than generic sound maskers. For more information on Sound Options Tinnitus Treatment, please go here. Hearing Device with Tinnitus Technology: An extremely discreet device that can be used in several ways to help with your tinnitus. This may be using the device to train your brain to ignore the tinnitus, and if you have a hearing loss, it will also help with your loss. How long will the Tinnitus assessment take? The assessment will take about 60 minutes. We ask that you come in 30 minutes early for your appointment to fill out the appropriate paperwork. You may also pick up the package before your appointment and bring it back with you. How much does the Tinnitus assessment cost? The assessment is $100, payable at time of the appointment. How much does the Tinnitus treatment cost? First, we need to determine if you are a candidate for the Personalized Tinnitus Program. To do this, we need to complete the tinnitus assessment. If you are a candidate for this treatment, our Audiologist will be able to provide you with this information at that time.